In a recent post, Mark Adomanis pointed out that the Russian economy has done significantly better than many other East European nations during the recent crisis and is now mounting a strong recovery. He also speculated on the effects of the crisis on the demography of badly-affected countries such as Romania, Bulgaria, and the Baltics, on the basis that “Russia’s experience during the 1998 debt default amply demonstrates that cutting healthcare budgets and pensions in the midst of an economic catastrophe causes a lot of excess deaths among vulnerable sectors of the population”. 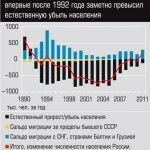 Now I’ve never really worried about the consequences on mortality of an economic recession, because I don’t buy into The Lancet‘s arguments that it was the reduction in Russian social spending in 1998 that contributed to the mortality wave of 1999-2002, since the increasing affordability of, and consumption of, alcohol was by far the more convincing factor. (Also, in industrialized states, recessions tend to correlate with falls in mortality rates). On the other hand, hard recessions – especially ones which result in reduced public spending on social welfare – usually are associated with substantial reductions in fertility. In this post I’m going to take a look at how valid these observations and theories are in light of the recent economic crisis in Eastern Europe. Russia. At the start of the crisis in late 2008, I expected Russia’s fertility rate to fall slightly – though nowhere near the magnitudes predicted by Russia’s “demographic doomers”, of course. (Though even for that I got a lot of flak). Yet ironically even my predictions turned out to be too pessimistic, probably because increased government spending meant that Russians’ social welfare hardly suffered at all during the crisis. 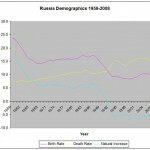 Even Russia’s fertility rate continued to climb, reaching 1.56 in 2009 (2008 – 1.49, 2007 – 1.41, 2006 – 1.30), a level last seen in 1992. And like I said, Russia’s trends towards falling mortality actually accelerated, with life expectancy for both genders hitting 69.0 years in 2009 (2008 – 67.9, 2007 – 67.5, 2006 – 66.6, 2005 – 65.3) – a level that was only ever previously observed in 1963-1974 and 1986-1991. Most encouragingly, Russians’ mortality from “vices” – homicide, alcohol poisoning, and suicide – have fallen back to their late Soviet levels. 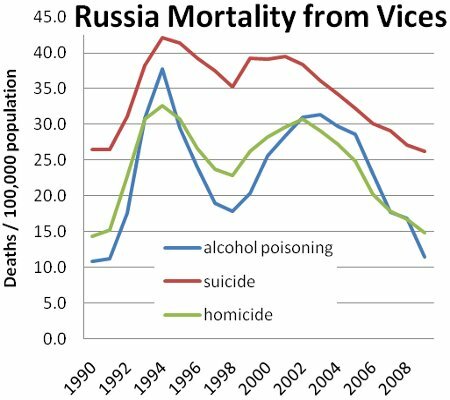 The decline in alcohol poisonings is particularly good because much of Russia’s “hyper-mortality” (including the high rate of heart disease) is tied to excessive alcohol consumption. Demographic improvements relative to the same period last year continued in Q1 2010, with the birth rate up another 1.3% and mortality rates falling by 2.0% (inc. by about 10% for external causes). (The figures on fertility are particularly significant when you recall that Russia reached the nadir of its economic crisis in H1 2009). According to Sergey Slobodyan’s demographic model, the data indicates that a projection of 1.9-2.0mn deaths and 1.8-1.9mn births in 2010 is feasible, meaning that natural population decrease will almost cease (the total population should grow, as last year, due to immigrants). Conclusion – contrary to hysterical predictions of economic and demographic apocalypse propagated about Russia in late 2008, the real impact on social welfare was very marginal and the demographic situation actually continued to improve. This year, Russia’s life expectancy will probably approach 70 years (still very low for an industrialized country) and its total fertility rate will hit around 1.6 children per woman (as in Canada). Although the mortality rate remains very substandard relative to the industrialized world, current healthcare and anti-alcohol initiatives are helping usher in rapid improvements. PS. There has been a small update to Rosstat‘s demographic projections. Its middle projection now indicates a population of 140.9mn and its high projection a population of 146.7mn in 2025, relative to 141.9mn in 2009; in the last few years, Russia’s demography has tracked between the High and Medium projections. (This is in line with my own forecasts). Ukraine. Mark Adomanis claims that Ukraine has a “much more serious demographic crisis than Russia”. But much as one can condemn Orange mismanagement of the economy and social relations, it can’t really be said in good faith that its demography is a lot worse. Whereas its birth rates are lower and its death rates are higher than Russia’s, this is in large part because Ukraine has a marginally older median age than Russia. Let’s instead use measures that cancel out the effects of specific population age structure. Ukraine’s life expectancy (68.3) was marginally better than Russia’s (67.8) in 2008 (World Bank), and its big mortality reductions in 2008-09 indicate that it kept the lead. Similarly, Russia’s fertility rate (1.49) is not awesomely bigger than Ukraine’s (1.39) in 2008, and may be partly or wholly explained by the fact that Russia’s demographic collapse in the 1990’s was both quicker and sharper than Ukraine’s. Finally, both countries have been displaying very similar demographic dynamics in recent years, despite their political differences – a moderate recovery in fertility rates (from a low base), and plummeting death rates (from a very high base). [Source: World Bank Development Indicators. Note that for all the vast differences in the political economy and post-transition success of Russia, Latvia, Belarus, and Ukraine, their fertility (and overall demographic) dynamics are remarkably alike]. Now what about the crisis, which hit Ukraine much harder than Russia? (Ukraine’s GDP declined by 15% in 2009, compared to Russia’s 9%, and it wasn’t cushioned by increased government spending on social welfare). Ukraine’s birth rate increased ever so slightly from 11.0/1000 in 2008 to 11.1/1000 in 2009 (but fell from 11.2/1000 in Jan-Feb 2009 to 10.7/1000 in Jan-Feb 2010). Meanwhile, its death rate decreased from 16.3/1000 in 2008 to 15.2/1000 in 2009 (and from 17.2/1000 in Jan-Feb 2009 to 16.4/1000 in Jan-Feb 2010). In crude terms, Ukraine had a higher rate of natural population decrease than Russia (-4.2/1000 versus -1.7/1000 in 2009), and its overall population is still falling fast because unlike Russia it does not have many immigrants. Nonetheless, the Ukrainian crisis is now easing and the new government seems to be moving from concentrating on historical grievances to modernization and stability. Given the inherent similarities between and increasing integration of Russia and Ukraine, their demographic dynamics will probably be likewise similar – a recovery of fertility rates to 1.7-1.8 within a few years, a rise in life expectancy to 75 years within a decade, substantial net migration to Russia and zero net migration to Ukraine. The result would be a slowly rising or stagnating population in Russia, and a stagnating or slowly falling population in Ukraine. Conclusion – Ukraine is experiencing a demographic recovery, with particularly impressive gains in life expectancy during the crisis. Though its fertility rate remained more or less stagnant, it now again shows signs of improvement – a good sign, since nine months ago Ukraine was still at its economic nadir. Belarus. Thanks to its isolation from the global financial system, Belarus did not experience much of an economic crisis at all. It’s GDP even grew by 1.5% in 2009, and has since expanded by 6.1% in Jan-Apr 2010 relative to the same period last year. But ironically, its demographic improvements have been modest. The birth rate rose from 11.1/1000 to 11.6/1000 and the death rate rose from 13.8/1000 to 14.2/1000 from 2008 to 2009*. (In Q1 2010 relative to the same period last year, the birth rate fell from 11.3/1000 to 11.2/1000 and the death rate fell from 15.3/1000 to 15.1/1000). The rate of natural increase eased slightly to -2.5/1000 in 2009, from -2.6/1000 in 2008. This means that Belarus retained a fertility rate of about 1.45-1.5 children per woman in 2009, compared to Russia’s 1.56 and Ukraine’s 1.4-1.45, and its life expectancy was somewhat higher than both at 70.5 years in 2008 (very slightly lower in 2009), compared with Russia’s 69.0 years in 2009 and Ukraine’s 68.3 years in 2008 (maybe a year higher in 2009). Conclusion – despite emerging from the crisis largely unscathed, the demography of Belarus showed no significant improvement (or deterioration). Latvia. Latvia saw a catastrophic decline of GDP of 18% in 2010 and its welfare state has been decimated to a degree unparalleled anywhere else in Europe (at least so far). From 2008 to 2009, births fell by 9.5% and marriages, a very rough indicator of future fertility, fell by a truly stunning 23.3%. The decline continued into 2010, with births in Jan-Mar falling by 11.6% and marriages declining by 22.4% on the same period in 2009. Since Latvia’s total fertility rate was a not too healthy 1.45 back in 2008, this means that it is now in one of the deepest demographic chasms in Europe. On the positive side, Latvia did see modest improvements in its mortality rates, which fell by 3.6% from 2008 to 2009 (though they’ve remained almost stagnant so far in 2010). Unsurprisingly, after a period of demographic recovery in the 2000’s, Latvia’s rate of natural population decrease has started opening up again, rising from a loss of 7058 people in 2008 to 8220 people in 2009, and almost certain to increase further this year. Small consolation. Going by the experiences of other countries in the region, the falling marriage rate in Latvia should have been accompanied by a simultaneously falling divorce rate, so the post-2008 annual decline in net couple formation should have been less than 20%. Estonia. Estonia’s had a milder recession than Latvia with a GDP fall of 14% (it’s all comparative!) and it did not decimate its welfare state to quite the same extent. It also started from a position of significantly greater affluence and its fertility rate was at 1.66 children per woman in 2008. The number of births fell by 2.6% from 2008 to 2009, and by a mere 0.9% in the first four months of 2010 relative to the same period last year. This decline was outpaced by improvements in longevity, with mortality rates falling by 3.7% in 2009 relative to 2008, and a further 3.5% in the first four months of 2010 relative to the same period in 2009. Since it now shows signs of mounting an early recovery, the crisis should not make a big dent in Estonia’s long-term demographic prospects. Lithuania. Their situation seems to have become somewhat worse, based on the monthly estimates of the population size for 2009. But their national statistics site is bad and doesn’t have detailed recent data so I can’t really say much more than that it is worse than in Estonia but far better than in Latvia. Conclusion – the crisis has been a demographic disaster for Latvia, with its total fertility probably falling to a “lowest-low” rate of around 1.2 children per woman by 2010. Since its economic crisis seems to be deep and long-lasting, with deleterious effects on social welfare, we can expect a resumption of demographic free fall and perhaps a rise in ethnic Russian emigration to (fast recovering) Russia. In contrast, Estonia’s stronger foundations weathered the crisis well and its total fertility rate, now at perhaps 1.6 children per woman, is still relatively healthy by East and Central European standards. Caucasus. In Armenia, the crude death rate remained unchanged at 8.5/1000 from 2008 and 2009, while the birth rate rose from 12.7/1000 to 13.7/1000, despite its big decline in GDP during the crisis. Given that its total fertility rate was at 1.74 in 2008, it is doing fine. Georgia is probably doing OK, since their population actually rose in 2009 – the only other post-Soviet year in which Georgia experienced population growth was in 2006, which happened to coincide with Russia’s deportation of illegal Georgian immigrants. Moldova. Doesn’t have vital stats for 2009. Its overall population fell by five thousand people in 2009 relative to 2008, which is lower than usual, since on most years it falls by around ten thousand. I don’t think this was due to demographic improvements – don’t forget that many Moldovans were returning from their work in Russia during its recession in 2009. Rest of post-Soviet space. Azerbaijan and Central Asia don’t need to be considered since they have healthy demographics anyway. The Balkans. Birth rates and death rates seemed to have remained essentially stable from 2008 to 2009 in Bulgaria and Romania, with a slight improvement overall. Crisis hasn’t affected them much – at least, not yet. Final conclusion – overall, the crisis did not greatly affect the demography of the Eurasian region. There continued to be modest improvements in the two most populous nations, Russia and Ukraine. The death rate has fallen rapidly during the crisis almost everywhere, the sole exceptions being Belarus and Romania where it increased by a tiny amount. On the other hand, birth rates have either risen slowly (e.g. Russia), stagnated (e.g. Ukraine), or fallen slowly (e.g. Estonia). The major exception is Latvia, where birth rates have collapsed at an amazing rate from regional average to “lowest-low”. This reflects the particular severity of the economic crash in Latvia. * The real rise in the birth rate and the death rate from 2008 to 2009 are actually slightly exaggerated. That is because from 2009, Belarus lowered its total population (on the basis of which birth and death rates / 1000 people are calculated) to correlate with the preliminary results of the 2009 Census. The actual number of births rose from 107.9 thousand to 109.8 thousand and the number of deaths rose from 133.9 thousand to 135.0 thousand.